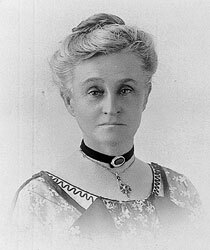 Today in Masonic History Edith Dircksey (Brown) Cowan passes away in 1932. Edith Dircksey (Brown) Cowan was an Australian politician and social activist. Cowan, born Edith Brown, was born in Glengarry Station in Western Australia on August 2nd 1861. At the age of seven her mother died in childbirth. Her father sent her to a boarding school in Perth. Shortly after his father remarried, it was an unhappy marriage and eventually her father would shoot and kill Cowan's step-mother. Her father would be executed for the crime. She would leave the school in Perth and attend Canon Sweeting a school near her grandmother's home where she was staying. In 1879, Cowan who was still Brown, would marry James Cowan a career public servant and the brother of the women who ran the school in Perth that Cowan had attended. Cowan would become concerned with social issues, particularly those that involved women and children. In 1894 she would help found the Karrakatta Club. The group was dedicated to women's education. In 1899, the group became associated with the woman's suffrage movement. After the turn of the century Cowan turned her attention to welfare issues. In 1909 she would help form the Woman's Service Guilds. In 1911 she was the co-founder of the Western Australia's National Council of Women serving as it's president from 1913 until 1921. From 1921 until the time of her passing she would serve as the Organizations vice president. In 1916, Cowan's efforts would get the King Edward Memorial Hospital for Women built. Cowan founded the Children's Protection Society. The basis of the society was that Cowan did not feel that children should be tried in an adult court. Her efforts would lead to the formation of children's courts and in 1915 she would sit on the bench of the first children's court. She would sit on the court for 18 years. In 1920, Cowan would become the first female justice of the peace. Also in 1920 the Australian Parliament would pass a law allowing women to stand for parliament. She would win a surprise victory gaining the seat for West Perth. Ironically she would defeat the Attorney General who had introduced the legislation that gained women the right to stand for parliament. She lose her seat in 1924. Cowan would join Freemasonry in Le Droit Humain also known as co-masonry.